It wasn’t the sort of news that would entice just anyone to change their weekend plans. 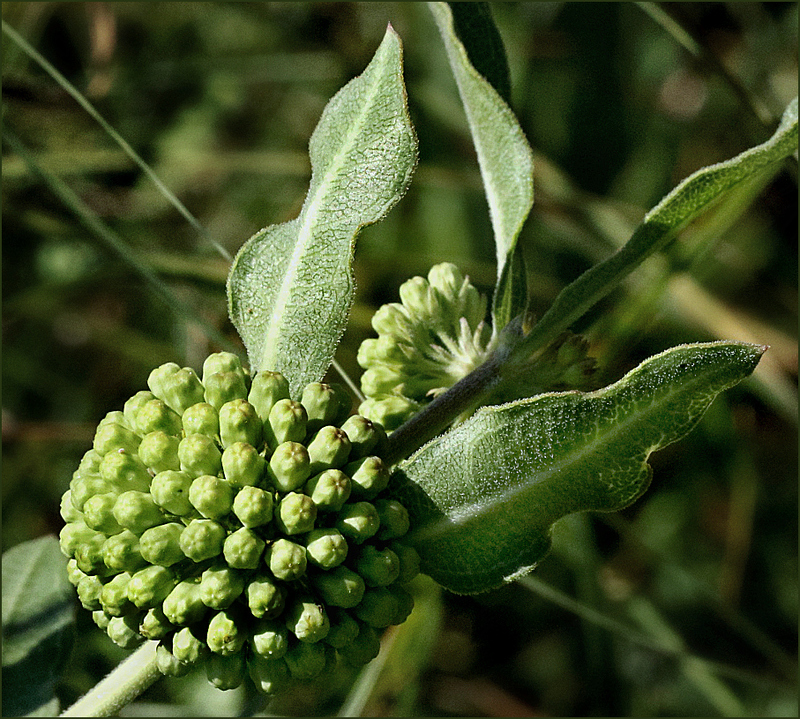 Still, as word began to spread that green comet milkweed had been found on the Nash prairie, and that Susan Conaty would lead a prairie walk to see both the milkweed and other late spring beauties, plans began to change. Susan knows Nash Prairie as well as anyone, and a chance to spend time there in her company wasn’t to be missed. I arrived at the prairie to find Susan had been delayed, but eager milkweed hunters already were comparing notes, trying to pin down the plants’ location with half-remembered bits of information, a few cryptic texts, and entirely wrong assumptions about the plant’s appearance. As we bumbled about, the search for the milkweed reminded me of my initial search for Nash Prairie itself. On that trip, a goat standing atop a shed and a utility substation served as unmistakable markers. Our flower-finding directions were more vague: turn left from the hay road; scan near the fence; look for the fallen gate; draw an imaginary line to the stand of trees. Finally, a cry of triumph drew us to plants we had to have passed at least a dozen times, oblivious to their presence. Still in bud and unblemished, the large round clusters of flowers and trailing leaves certainly made the name “green comet” understandable. With the day’s primary goal achieved, people spread out to explore the prairie: taking photos, identifying unusual plants, and gauging the readiness of seeds to be plucked. Among the plants still in bloom, the unfailingly cheerful black-eyed Susan (Rudbeckia hirta) bobbed and nodded in the breeze. I spent some time chasing butterflies among the Rudbeckia, hoping to photograph a black swallowtail at rest. Unsuccessful and ready for a different subject, I scanned a nearby group of flowers and realized I’d found something I never imagined I’d see: an example of fasciation. 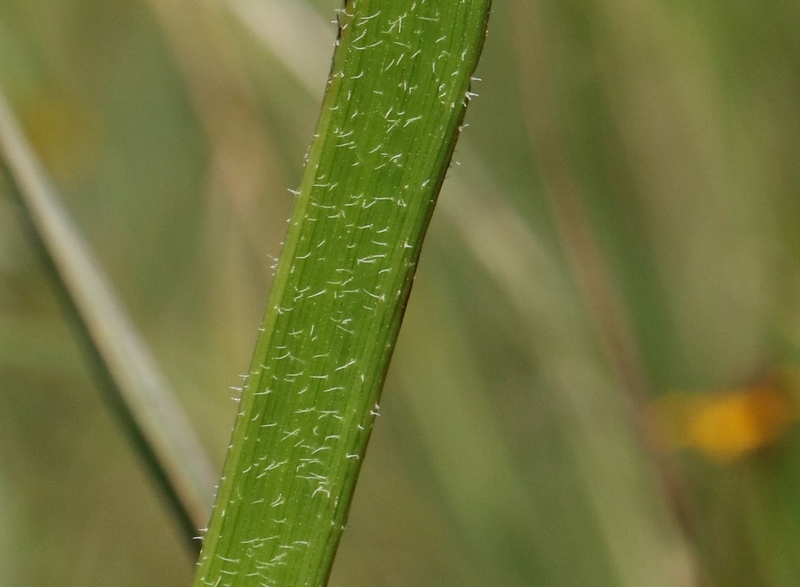 Derived from the Latin word fascia (“a band, bandage, swathe, ribbon”), fasciation describes an abnormal fusion or flattening of plant stems, flowers, fruit, or foliage. 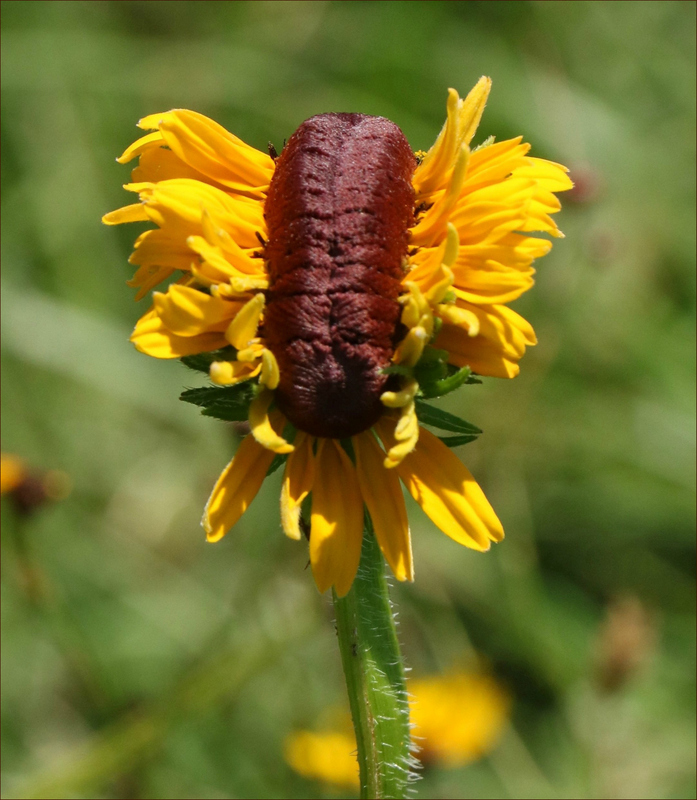 In the case of this black-eyed Susan, fasciation has caused both a broad, flattened stem, and a double, or “twinned” flower. The causes seem to be varied, and somewhat mysterious: viruses, genetic abnormality, insects, or physical damage all have been offered as reasons for the phenomenon. Indeed, it was: wholly unexpected, entirely delightful, and odd as odd could be. Over time, the excitement I’d felt at the discovery abated, although I enjoyed looking back at the photos occasionally. Then Chris Helzer added a new gallery of photos to his site, “The Prairie Ecologist,” and brought the joys of serendipity back into focus. There’s no question Walpole had a vibrant imagination and a taste for high jinks. When he wasn’t busy shepherding tourists through Strawberry Hill, his home outside London, he wrote volumes of letters One of his most famous, a 1765 letter to Jean-Jacques Rousseau, written after Rousseau fled persecution in Geneva and took up residence in France, was a fake. Rousseau first attributed the letter to Voltaire. Later, he suspected his friend David Hume, and the letter played a role in a spectacular falling out between Hume and Rousseau. When he wasn’t stirring up trouble, Walpole amused himself by renovating Strawberry Hill, his “Gothic mousetrap” of a house. Like most collectors, he wanted his objects to be ­admired, and Strawberry Hill was the perfect showcase. ­Visions have always been my pasture. Old castles, old pictures, old histories and the babble of old ­people make one live back into centuries that cannot disappoint. Michael Snodin, ­curator of the Walpole exhibit at the Victoria and Albert Museum, suggests Walpole’s cultural legacy was “to pioneer a kind of imaginative self–expression in building, furnishing and collecting,” but his fixation on the house and its furnishings didn’t exclude other interests. Much of Walpole’s “imaginative self-expression” was centered on language. Today, his extraordinarily useful word serendipity has become familiar to nearly everyone, and he surely would be pleased by the increased use of the word and its derivatives. In that sense, my discovery of a fasciated black-eyed Susan on a day meant to be focused on milkweed surely was serendipitous. But it’s worth noting that Walpole’s serendipity is more than accidental discovery or happy coincidence. For Walpole, sagacity — the ability to link apparently unrelated, innocuous or irrelevant facts — was equally important if previously unsuspected pathways for exploration and delight were to open. Someday, a more sagacious serendipitist may stumble across another fasciated flower and make the intuitive leap to the unrelated, innocuous, or seemingly irrelevant facts that finally explain the phenomenon. If — or perhaps when — that happens, it surely will be fascinating. Well, for people who are “always hoping to bump up against some unexpected oddity of life,” serendipitists strikes me as a more positive name than bumpkins. By the way, I was just reminded that on your “Who I Am” page you used the word serendipitous. What serendipity. I’d forgotten that I used serendipitous there. The word’s been a favorite for years, and I remember when I first learned it: in a college sociology class that referenced the famous case of the floppy-eared rabbits. Thanks to a sagacious researcher and those papain-injected rabbits, we gained Adolph’s Meat Tenderizer on our grocery shelves, and I gained a great word. I’d not heard of that rabbit-related discovery but just went looking and found more details. That’s the kind of article I was looking for and couldn’t find. I kept turning up abstracts or overly-scientific explanations. Thanks for finding that. I really enjoyed reading it. For people? Serendipitists probably do beat bumpkins. On the other hand, you’ve bumped into yet another word with nautical meaning. 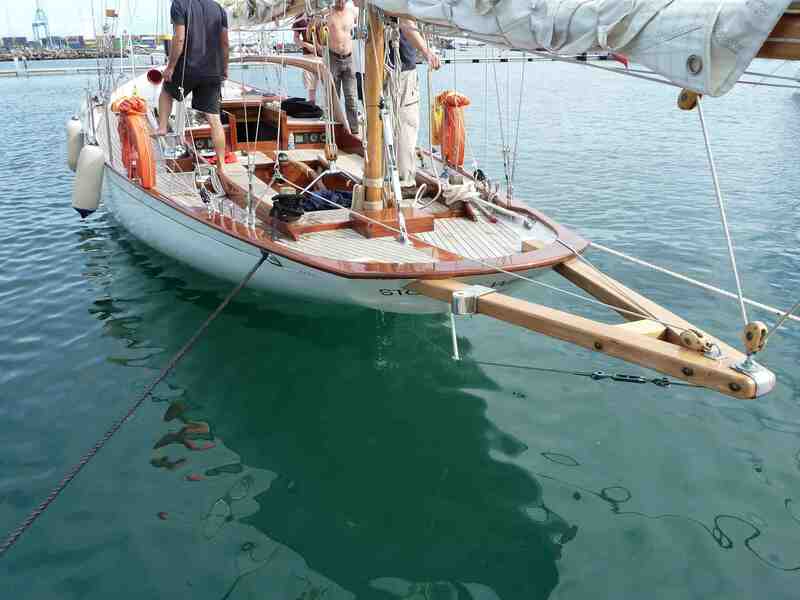 Bumpkin also can mean a short, often V-shaped boom that extends out from a boat’s stern, allowing a backstay or mizzen sheet block to be attached. One advantage is that it allows for a longer mainsail boom, and sometimes it eliminates the need for backstays. Boats with bumpkins almost never are ugly. Fasciation is common in echinacea, too. And Saguaro cactus. Some plant growers prefer to remove the affected plants from the sales area, but some just let them be, available to the customers. That must have been a lovely day out. It was interesting to read about how many different plants, from strawberries to cactus, can exhibit fasciation. I did read a couple of trade articles that advised removing such plants from stock, but others (more recent, I might add) said they should be left for those who enjoy botanical curiosities. At least everyone noted that if you get a fasciated plant and aren’t pleased about it, you can just cut out the odd portion and leave the rest of the quite healthy plant. It was a beautiful day, and an especially interesting one because spring plants (like ladies’ tresses and Amsonia) were fading but still around, while others (rattlesnake master, rosinweed) were just coming on. That’s a great quotation — it certainly fits a variety of circumstance, doesn’t it? Great post! I wasn’t aware of the great comet milkweed or fasciated Black-Eyed Susans. I misread “fasciated” at first as being “fascinated” which sounded right. It does look a bit like a woman’s fascinator, after all. But thanks mostly for filling us in on the origin of the word serendipity. As a major beneficiary of serendipity over the years, I am humbled to be so ignorant of its beginnings. But now, with that new bit of knowledge, I can continue on as a fellow serendipitist. Well, we’re even now, because I’d never heard of a woman’s fascinator. Once I did an image search, I realized I’ve seen them (often in news stories about the Royals or the Kentucky Derby) but never knew the term. This was the first comet milkweed I’d seen, and the first fasciated plant of any sort. Others seem to see them more frequently, and I suspect that has as much to do with their ability to see as with an abundance of fasciated plants in their neighborhoods. It brings to mind what Chester Cornett said when he was asked,”Can anyone learn how to use a drawing knife?” Cornett said, “I’d say so, excepting… you got to learn to get interested in anything to learn it.” I suspect getting interested aids seeing, too. I’m glad you enjoyed the post. It’s certainly filled with themes I’ve found in your blog over the years. What a lovely ramble of a post and lighting upon it today is truly serendipitous. It’s the kind of ramble about discoveries which may not be earth shattering but allow curiosity and exploration to take over a somewhat bogged down mind like mine.Thank you. Your delightful search for trinkets gives me hope that there will again be trinkets for me to unearth and to share in this forum. Of course I thought of you when I was writing this, wondering if you’d ever made it to Walpole’s fabulous pile. The Museum of Fine Arts here had an exhibit that included some of Walpole’s letters and other ephemera, although it wasn’t focused on his life. Called “Houghton Hall: Portrait of an English Country House,” it included some of his items because of his relationship to Sir Robert Walpole, whose collections from Houghton Hall were featured. Several rooms from the house were re-created, and it really was quite fabulous. The nice thing about rambles is that they rarely require pith helmets and grim determination. The discoveries may not be earth-shattering, but they can be equally satisfying, and curiosity is curiosity, whatever its object. I can’t guarantee you a fasciated flower, but I can guarantee there are trinkets galore, just waiting for you. Ramble on! As always, your post is entertaining and educational. I’ve always subscribed to the notion that “happy coincidence” best describes ‘serendipity’ but no matter how it’s described it’s a wonderful whimsy word. If sunflowers can be ‘fasciated’ like your black-eyed Susan I’m pretty sure I had one in my yard. I thought of it like Siamese twins. Fascinating to look at but too top heavy to stand for long. “Siamese twins” is one of the phrases I came across in descriptions of fasciation, and I also read that some flower heads become so large and heavy that they have to be supported. Sunflowers certainly can be fasciated, as can most plants, so I’d guess that’s exactly what you had. When I read someone’s advice to check out large strawberries for the phenomenon, I realized that I might well have seen that, too. One of the most amusing photos I came across showed a normal asparagus stem next to one that looked like a steam roller had pressed it flat: fasciation at its best. While it’s coincidence rather than serendipity, it amused me that on a day I went out to the prairie to learn from Susan Conaty, the botanical surprise of the day was a black-eyed Susan. I can’t remember what color Susan’s eyes are. I’ll have to check that out. This is one my favorite articles for the year 2017. Nature, history, vocabulary, English eccentricity, prairies, photos — it’s just plain great from start to finish. You’re surely going to be appointed Serendipitist Extraordinaire. I’d never looked up the etymology of sagacity, but when I did, it made perfect sense that its root is “*sag — “to track down, trace, seek,” or that it was used in the 17th and 18th centuries to refer to animals’ “acute sense of smell.” Sniffing out connections is a good part of what Burke was describing, and it’s the fun of a post like this. The hard part is laying out those connections in a way that’s clear and understandable. Most of the time, it feels like working without a net. One of these days I’ll probably go “splat!” but I suppose that’ll be entertaining too, in its way. It does occur to me that sagacity is a fine quality for anyone making their way through a complex environment: back-country hikers, game trackers, detectives, medical diagnosticians. It may take time to make sense of those apparently unrelated details, but we’ll never make sense of them if we don’t notice them in the first place. The black-eyed Susan was quite a find! I love it when things like that happen. In the thousands of black-eyed Susans I’ve seen and enjoyed, I’ve never seen anything like it. Have you seen any sort of fasciated plant? One article I read suggested that certain species will take odd forms in one environment, but not in another. Perhaps in your area, the black-eyed Susans aren’t as affected. There’s so much mystery to it all. Everyone seems in good agreement about what happens, but the why is something else entirely. I’ve noticed that when I finally find a certain species after hunting and hunting for it, I suddenly see it everywhere. I hope the same thing happens with these odd little plants. I’d really like to see examples, and in other species. Yes. I have an old photo of a huge old Saguaro cactus that was fasciated. If I can find it I will send you a copy. Linda, this is the first I’ve heard of a fasciated flower — thank you for educating me today! We have brown-eyed Susans, but we didn’t plant them. Perhaps the birds did. Great photo of the ant on the milkweed! I’m always surprised by the number of bees, flies, spiders, and ants — and unidentified “others” — I find on flower photos after I’ve uploaded them to the computer. I don’t remember seeing this ant at the time, but there it is — a fun little detail. Well, I certainly learned more than one fact today. You have simply a plethora of facts running around in your mind, don’t you?!! Thanks for a very interesting visit, Linda. There’s just so much to learn and enjoy, GP. And, as far as I know, our minds don’t really fill up like a hard drive, so I’ll just keep on collecting tidbits. By the way, our new Lone Star Flight Museum is open now. That is why I’ve seen so many vintage planes flying around. There’s a lot to explore on their site, including fabulous photos of the vintage aircraft they have. I didn’t realize that you can go up in some of them, too — for a fairly reasonable price. Would you like to fly in a Boeing PT-17 Stearman or a Boeing B-17 Flying Fortress? You can do it — that Stearman would be a hoot. YES – I would LOVE it!! That’s the best part about our brains, isn’t it? The more we pack in, the bigger (and better; ) they get! We enjoy when serendipity happens. We hope it visits and it often does. Today, we hiked in an area nearby frequented by trail bicyclists. There are many numbered trails of varying difficulty. We only saw two bikers. When I see something like that, I always wonder whether it’s left over from the past, or a hint of things to come. I must say, Santa on a tractor is perfect for your area. Here, we get Santa on boats, and in Louisiana, he often shows up in a pirogue. It’s cultural adaptation at its best and, in the case of your hike, a nice bit of serendipity. From a distance, we wondered if it was a feeder or remains of some old monitoring equipment left by the corps of engineers. Nope. It was someone’s expression of fun. They had to go to some trouble to set it. Cars aren’t allowed within a quarter mile of the spot along the trail. Another post so well done, thank you! I had a few fasciated black eyed Susans in the border this year, they always intrigue me. Enjoyed reading of the start of serendipity. Walpole sounds an interesting fellow, indeed. Glad you enjoyed it, Brig. It seems to me that gardeners tend to see things like fasciation more often, which makes sense: masses of flowers make an occurrence more likely, and gardeners spend more time looking at what’s around them. On the other hand, I’ve seen photos of cactus and other plants standing in splendid isolation, gnarled-up beyond belief. The whole Walpole clan was pretty interesting, beginning with Robert, who served as England’s first prime minister — after serving time in the Tower of London. (He’d been impeached for corruption by political enemies, but when the parties in power flipped, he was back in business.) It seems that inherited wealth and plenty of connections gave Horace remarkable freedom to indulge his passions for collecting and letter-writing. It’s good that so much of the collection remains intact. This looks like such an interesting post Linda. Unfortunately today my dumb eyes are not cooperating so I will simply say “Like”. But I DID like the mildweed buds especially. I wish I could give you a new pair of eyes! But I’m glad you could see the buds, and I’ll accept your “like” with pleasure. Have you tried a text-to-speech program? I just copied-and-pasted the first paragraphs of this post into this program. I was surprised by how well it did. You could listen to posts instead of reading them, like an audio book. There are lots of text-to-speech sites. The one I linked also shows the text in an enlarged format, for easier reading along with the spoken text. I learn something every visit here! While I have never heard of a fasciated flower, I have seen a few! I know what to call them now! When I come upon the word serendipity it always takes me back to a textbook reader I had in school as a young girl. It was put out by Houghton Mifflin, back in the 1970’s. It’s interesting that I was introduced to serendipity sometime in the late 1960s, and it popped up in your reader in the 1970s. A famous study about the phenomenon was published in 1958, and look at this chart that shows the frequency of the word’s use. It’s pretty easy to spot the study, and track the word’s adoption. One could spend literal hours following the links via that chart! And I spent way too much time this afternoon plugging in other interesting words. Fascinating is all I can say! That’s one of the best tools I’ve found. It can help resolve all sorts of problems, especially when it comes to questions about archaic vs. modern words, etc. Gardeners and naturalists are serendipitists–we’re always looking for one (or several) things, distracted by something that catches our attention. Then, we forget to weed, or we lose our clippers, or we learn something new. Great post and photos! But isn’t that kind of distraction fun? When we suddenly see unexpected connections among things that have compelled our attention, it’s even more delightful. And besides, the weeds will be there tomorrow, and the clippers will turn up eventually. But learning something new? There’s nothing that beats that. How interesting! I think you did a great job of photographing the phenomenon. And I enjoyed the tale of Mr. Walpole (although in my head I keep hearing “Rumpole of the Bailey” which is an entirely DIFFERENT sort of person). I can’t remember if I read that one before, but it’s a good one — for many more reasons than just the use of serendipity. You ought to have fun with this year’s poem, with new perspectives, geographic and otherwise, to work with. I really was happy with the photos, although I wish I could have found a way to show both flower heads. Part of the problem was that the sun was directly overhead, and I was having problems with shadows. Still, for my purposes they’re fine. My mom used to love “Rumpole of the Bailey,” as she did a lot of British series. I haven’t thought of him in ages. Maybe I’ll see if our library has a DVD of a season. 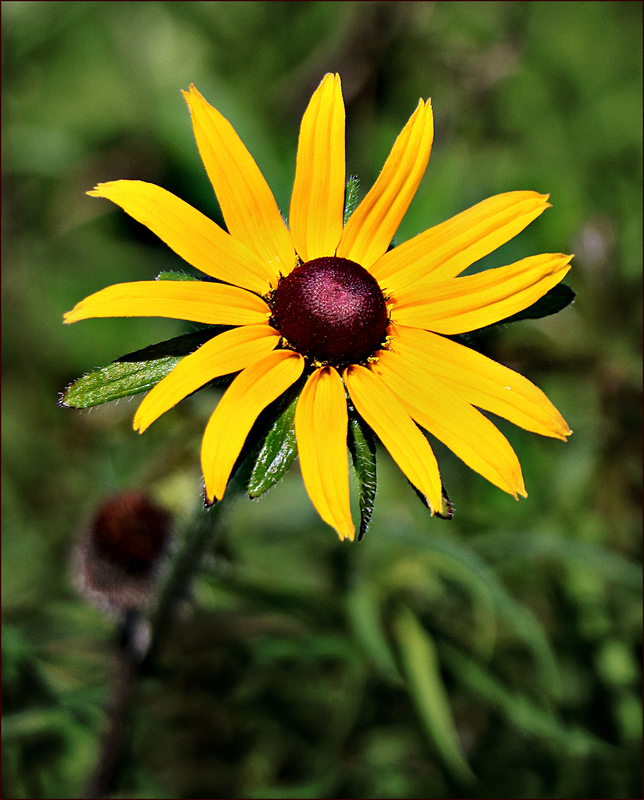 It is never too late to meet up with the ‘black eyed Susan’. Isn’t there a rather melancholic Russian song called by that name as well? I’m not particularly familiar with Russian music, but I’ve never heard of a Russian song named after the black-eyed Susan. What I do know is the Laura Nyro song, “Lazy Susan.” It’s lovely and quite melancholy. Here are the lyrics, so you can listen along. Enjoy! What a lucky find and your photos are excellent showing the unusual shape. Serendipity has to be one of my favourite words and as an amateur photographer, it comes to mind more often than I might share online. After I found this little gem, I started looking for even more images of fasciated plants. I began to think they’re a dime a dozen — that I ought to be seeing one around every corner. That’s a bit of an exaggeration, of course, but they’re clearly more common than I realized. The trick is learning to see them. Coincidences are one thing, and surprises are another. But true experiences of serendipity are treasures — more common than we think, but rare enough to bring delight with them almost every time. I’ve been trying to decide if I’ve ever had an experience of negative serendipity, and I don’t think I have. I’m sure they exist, but I’d be just as happy to remain ignorant of them. I don’t think I’ve ever had negative serendipity either. Maybe that’s part of the meaning of the word – positive and delightful discoveries when we’re looking or doing something else entirely. To Linda, my friend, the serendipitist. You do experience so many delightful dips into serendipity, and share them so skillfully. I would never have noticed your fasciatious (?) Susan. And the picture with the sunflower, spider and ant. Wonderful. I wonder if they met on the same side of the petal, and , if so, who won. The things you observe are so fascinating. Thank you. When I was writing this, I had to look up serendipitists to be sure it was an acceptable word. I’m not sure I’ve ever come across it before, but all the dictionaries had definitions and examples. I couldn’t find fasciatious. Probably the best choice would be fasciated, which goes right along with being fascinated by the flower. The spider and the ant sounds like an Aesop’s fable, doesn’t it? Crab spiders don’t weave webs; they sit around on plants and wait for their prey to come to them, so I hope that ant was paying attention. On the other hand, I’ve read that crab spiders prefer other prey: perhaps because of the taste of the ants. Who knew there could be so much drama on a flower petal? If “all the world is a stage” it is amazing to see all the little “sub-stages.” Keep telling me these delightful scenarios. Serendipity is a favorite word of mine. Another I have enjoyed is synergy. Enjoyed this latest word plant adventure from you! I’m glad you enjoyed it, joared, and I’m glad to know you’re another serendipitist. Just don’t let synergy push syzygy out of the picture! Wow! Syzygy is a new word to me. I first encountered it when it was the name of a New Music Ensemble at Rice University. It’s not one I use very often, but I’ve never forgotten it. We, as a species, are uniquely engineered to be serendipsters. We are blessed (or afflicted) with a mind that seems to have one question hardwired into it. Individually and as a species we are always standing someplace looking toward someplace else and asking ourselves, “I wonder, what’s over there?” It’s how in only 70,000 years, about 10,000 of us ended up populating every continent but Antarctica. Serendipitous indeed, your black eyed find. And now we have another continent to consider, although populating Zeelandia isn’t going to be any easier than putting up a Whataburger and a strip mall in the Antarctic. I laughed at serendipsters. It feels like a weird combination of dip (that negative term for hated classmates from the ’50s and ’60s) and hipster. Put those two words together, and it’s impossible not to remember the Hippy-Dippy Weatherman. That feels like 70,000 years ago. It crosses my mind that the world could be divided between those who ask, “I wonder what’s over there?” and those who shrug and say, “Who cares what’s over there?” In a related note, I’ve always thought the Bear Who Went Over The Mountain is the best role model for traveling. There’s a lot to commend just going, to see what we can see. What an amazing post Linda! Such gorgeous photos! Here I learnt a lot of things and a new word fasciation! This post brought back to my mind an old blog post of mine on serendipity. By sheer sendipity how I had found out the Romdul flower (Mitrella Mesny) the national flower of Cambodia and the excitement I felt then! Then, when I opened my FB page photos of Romdul flowers popped up as a three year old memory! Is that serendipity?! Thanks for your beautiful posts…waiting for the next one. “When I was a child, living in Surin,Thailand, I had always picked this flower to spin like a top. Spinning one after the others quite simultaneously was so enjoyable and wonderful. I’m so glad you were able to find it, and that you have it as a memory — on Facebook and otherwise. Have you ever eaten the fruit? Maybe that will be your next treat. What a nice post. There’s always a story that goes along with a discovery, and this is delightful. It’s lovely that the vendors were willing to help you obtain some flowers, and it’s fun to see the trees, too. They really are attractive, even apart from their flowers. Green comet milkweed, fasciation, and Walpole have led me into the land of Serendip; on looking up Horace, I remembered Hugh (Walpole), and, upon investigating Hugh’s story, I discovered that he was born in Auckland, NZ. One could hardly say he spent his formative years here but it’s interesting that his first novel, The Wooden Horse, is about a staid and snobbish English family shaken up by the return of the son from New Zealand. Getting back to Horace (a forbear of Hugh’s), I found this delightful post on two of Horace’s most highly prized books , Two Books of Swan-Marks, on Vellum. Thus began my introduction to the fascinating subject of swan marks. https://campuspress.yale.edu/walpole300/14-swan-marks/ So I think I am about as far from green comet milkweed as I could get, although I expect Horace W would understand your fascination with fasciation, as well as the spirit of the milkweed hunters! And now you’ve led me even farther afield, into the mysteries of swans as status symbols for the wealthy and royal, “swan upping,” and assorted other inscrutable British traditions. From literate letters to the editor to Twitter wars and Facebook rants: how the mighty have fallen. That blog you linked to is marvelous, and I’ve subscribed for the pleasure of the year’s entries. It strikes me as wholly appopriate that Mr. Lewis, whose name is on the Walpole Library, turned out to be as much a collector as Horace Walpole himself. Yes, I was very impressed with Mr Lewis, the collector. And, if we were playing a game of one-upmanship, your swan upping link would be one up on my swan mark link. Twitter wars and Facebook rants are indeed a far cry from literate letters to the editor. It would surprise me if you hadn’t, Ellen. You’ve got the kind of garden that seems suited for them: lots of flowers, plenty of natives, and a resident gardener who wanders around looking at things. It tickles me that you used serendipitous in your bio. I used it in mine on these blogs, too. It suggests that both of us do a good bit of what I like to call intuitive planning: the sort of planning that’s recognizable only in retrospect. Serendipity is a beautiful word – just the sound of it and the phonetics. But it also included a beautiful trust in the world. We have a lot to gain in letting serendipity do its work, it can broaden our understanding of the world and open eyes for us. And give hope. I think it was fun to read about your hunt for green comet. Gorgeous photos. As a word, serendipity is beautiful; it’s as pleasurable to say as my favorite word for wind stirring the trees: susurration. I think you’re right that trust is a large part of the experience of serendipity. People who trust that the world has gifts to give are more likely to recognize those gifts when they appear. People who are cynical, defensive, or self-absorbed are less able to recognize the graciousness in the world: or, if they recognize it, they prefer to refuse it. You would have enjoyed photographing the milkweed seekers. We were as earnest and occasionally comical as a group of second-graders on an outing. But we found the plants, and then I found even more. I’m glad you enjoyed both the “comets” and my Susan’s photos! Susurration is a beautiful word. Thank you for that! 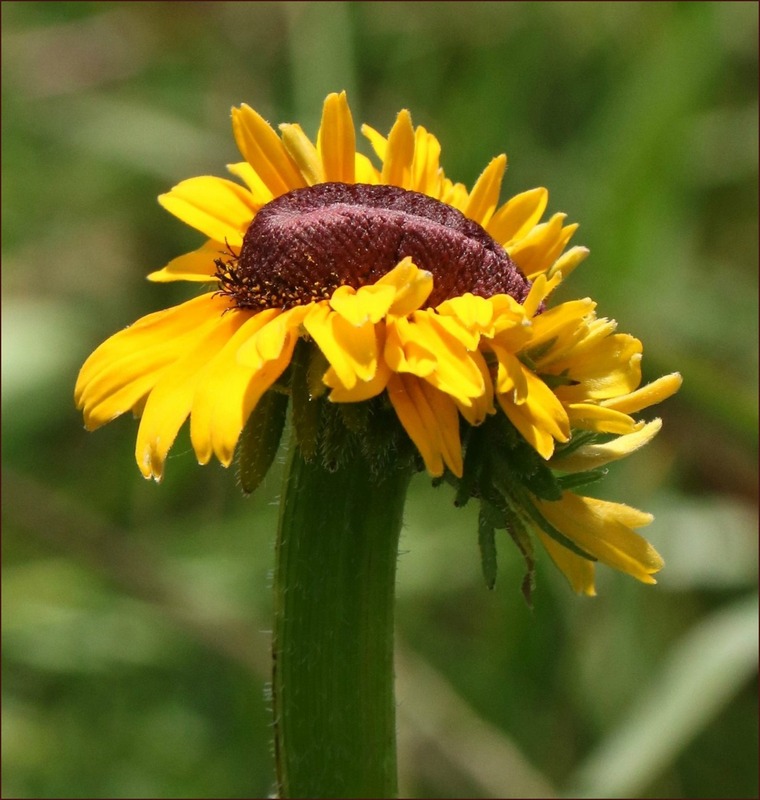 I can guarantee you the ant and the spider aren’t on a Texas black-eyed Susan, because the photo was taken by Chris Helzer on a Nature Conservancy prairie in Nebraska. The paragraphs surrounding the photo provide a link to his blog, and the photo gallery where he has this posted. He was kind enough to give me permission to use the photo when I found the reference to serendipity on his blog. I’ll ask Chris what it is. I’m betting that it’s Helianthus rather than Rudbeckia, but that’s nothing more than a hunch. I haven’t spent enough time tooking at the undersides of these plants to make much of an informed guess. Now that we’re talking about it, though, it will be fun to find out which it is. Who knows? Maybe it will turn out to be another suggestion I was just given — a roughstem rosinweed. And once upon a time you mentioned you might start a blog about your art. I think about that now and then — any chance it might happen? That’s a great metaphor for this flower’s appearance. I read that with cacti and other succulents, a crest describes the effect better. I do love the flat stems. I still can’t get over the fasciated asparagus I saw: one normal stalk next to one that looked like it had been pressed with an iron. There are strange things out there! Some of our trees lilies exhibited fasciation last year. There are many strange things out there for the finding. I am fascinated by the fasciation of the black- eyed Susan. Goodness that was serendipity to find the plant. As well as a new species of milk weed to add to your list of plants that you have seen and photographed. You do have a keen eye which also makes one an excellent bird watcher. I am always pleased when you write about the coastal prairies. I think you know that I am partial to the now rare landscape of a genuine prairie. And now I have learned a new word, serendipitists. Over and over, I’ve searched for this plant or that. Then, just when I think I’ll never get to see one, it’s happened: I’ve found ladies tresses orchids, white prickly poppy, prairie gentian, rain lilies. Now, I’ve seen fasciation, and it still tickles me to think of it. There’s a 100 acre piece of prairie north and east of you that the Native Prairie Association of Texas is attempting to save. It’s called the Paul Mathews prairie, and it’s near Floyd — very close to where my gr-gr-grandparents camped on the prairie after the Civil War, east of Melissa. I’m hoping to be able to get up there and take some photos of land that surely looks much as it did when they were there, despite inevitable changes. Knowing that my gr-gr-grandparents camped near a piece of Texas prairie that I’ll be able to photograph 150 years later? That’s serendipity. I’ve always seen animal-like features in plants, and the fasciation looks just like a creepy caterpillar to me. Call me oversensitive or just plain weird, but I had trouble even looking at that fleshy flower! The milkweed, in contrast, is very appealing; it brings back all sorts of memories of wandering in fields as a kid. I do enjoy your prairie outings, and the etymology lesson was pretty fun, too! I often see things in nature, too, but the caterpillar completely escaped me. Now it’s clear as can be, and I can see how it might seem a little creepy to someone who’s not fond of the critters. I don’t mind them. In fact, I bought a print of a photo taken by a friend that shows a roly-poly caterpillar munching on a bit of greenery. I call him my Big Green Guy. I suppose hanging a photo of a caterpillar is pretty weird, but he surely is cute. I’ll just link to his photo, so you can look, or not, as you choose. Once I became interested in native plants, I started learning astonishing things, including the fact that milkweed has flowers. As a kid in Iowa, milkweed meant brown pods and fluff in the fall. It never occurred to me to wonder where the fluff came from. I was too busy playing with it. That’s easy. It was your inner mountaineer imitating George Mallory, and clicking because it was there! Ha – that’s great! And true. Of course, the condition for the possibility of serendipity is open eyes, minds, ears, etc., and so some have more serendipitous moments than others, I think. So, it is not so very surprising to me to see that you have had more than a few! On another note, I see that you describe milkweed as a spring flower while it was just about to bloom in August when I was at Six Nations of the Grand River Nation this summer. And that reminded me of one of the very first visits of my half-brother and his wife from Houston, who were surprised to see pansies in July in Alberta. They knew them as February (?) flower, while we now know them as a May flower in Ontario. Flowers, it seems, admit many temporal adjectives! When it comes to true experiences of serendipity, it’s occurred to me that getting rid of preconceptions can help, too. Starting a trip with a list of things to see, or starting a day with a schedule, often is necessary and usually good, but knowing ahead of time what we’re going to see or what we’re going to do can militate against unplanned delights. For that matter, so can allowing entities like Facebook to “curate” what we’ll see, or Yelp reviews to dictate where we’ll go. I was telling someone this morning about the sign I saw at a Starbucks yesterday: “We’ve curated these sweets especially for you.” The thought that either a nameless and faceless middle manager or the phone-obsessed teen behind the counter would be curating my dessert was pathetic and hilarious, all at the same time. 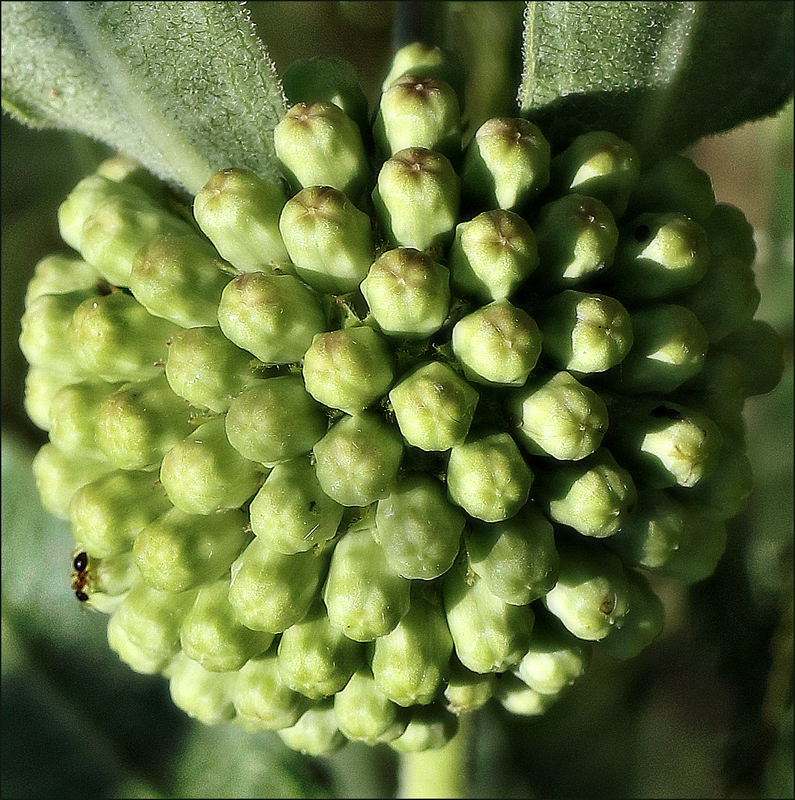 We have just over thirty species of milkweed in Texas, and they actually will bloom all the way from April through October, depending on conditions. As for the pansies, they are one of our winter flowers, along with geraniums, cyclamen, and snapdragons. Landscapers are setting pansies already, and at just the right time. We had a front come through this morning, and there are hints of lows around 50F/10C this week. I have the windows open, and plans for a walk later today — walking being another good snare for serendipitous finds! Fungi in our lawn are serendipitous. A couple of years ago, I stumbled upon a huge puffball, another year a toadstool all of six inches across. Swathes of inky caps still surprise me this season, and an odd toadstool or two still crop up in odd places. I remember puffballs with affection. They were such fun to find, and to stomp. Of course, when I was living in puffball land, they were just an expected part of the scenery. If I were to find one down here, that would be something else. I’ve never heard of the inky caps, so I looked them up. Some of the pages I found claim they’re edible, but I don’t believe I could bring myself to do it. I had no idea that there are people who wait for certain plants to bloom and then flock to see the result. Really. I know birders follow the rare birds, hoping for an opportunity to spy one in their spyglasses. Not surprising that I have never heard of a fasciated plant. As far as serendipity, I have always admired the word itself and associated it with spirits, mysticism, and luck. I’m not as enthusiastic (or obsessed) as some people, but I have been known to leave work, get my camera, and make tracks for a field after getting a phone call from a friend who said, “I was out mowing, and there are ladies’ tresses orchids in my back yard!” And there is something about finding an uncommon or rarely seen species that’s thrilling. That’s one reason I enjoy roaming the countryside more than visiting gardens. Gardens are great for learning, or practicing photography, but the thrill of the hunt — and the serendipitous discoveries — are exciting in a different way. I’d like to find the origin of that little voice. As long as we can hear it, does it matter from whence it comes? I’ve never seen a green comet milkweed or a fasciated black-eyed Susan. For an instant, I wondered if it was a caterpillar taking a snooze on a black-eyed Susan. The structural appearance of the green comet milkweed reminds me of the dryer balls that claim to be better than fabric softener when thrown in with a load of clothes. Isn’t it caterpillar-like? I’d not noticed that until Lexi mentioned it, and now it’s hard not to see it. Your comment got me thinking about the ways we incorporate that round shape into our lives: not only dryer balls, but meatballs, beach balls, tennis balls and game balls of every sort… The list is pretty extensive. Of course, we live on the biggest ball of all. I still remember how fascinated we all were when the first photos of earth from space appeared. It was a perspective changer, for sure. Otto mentioned the beauty of just the sound of the word serendipity, and I like his other ideas…and yours about calling ourselves serendipitists – cool idea! I just posted about seeing a statue of the Three Graces while in NY, at a museum, then the next day seeing an Asian version on a similar theme, with unmistakable similarities, and at the time, I did think it was wonderfully serendipitous. I saw fasciated cacti at Organ Pipe NM in January – fascinating fasciation! Don’t you love it! I’ve seen it on wildflowers – just this year, too, and now I can’t remember which flowers…but there were many stems among the group that were flattened out in that distinctive way. I’m interested to see your post about the Three Graces. Your mention of them started me thinking about how many times groups of three play into our story-telling: the three Wise Men, the carved jade monkeys sitting on my grandmother’s knick-knack shelf that spoke, heard, and saw no evil — even Wynken, Blynken, and Nod, whose story was one of my favorites for bedtime. I think I might have seen photos of the Organ Pipe cactus — perhaps even from your postings. One nice thing about fasciated cactus is (I assume) that they hang around for a good while to be admired. I didn’t realize until I did more reading about the phenomenon that plants can be bred for fasciation, too. I can’t remember now which plants it’s favored for, but apparently there’s a market for them among collectors. Lucky you, to see so many! Now that I’ve seen my first, I hope I don’t have to wait another 70 years to see one. If I did, I’d be the freak of nature. Thanks, Becca. Where would we be without stories? Telling them and hearing them both are such fun. That’s why I enjoy your Sunday Trees so much. Those photos are great opportunities for telling short little stories, just like this flower was. I was just thinking how well those images turned out when you mentioned what a difficult time you had ;-) The lighting you’ve captured perfectly shows off texture and shape and those little fuzzy hairs. Thankful for the delightful stories that accompanied your serendipitous find. 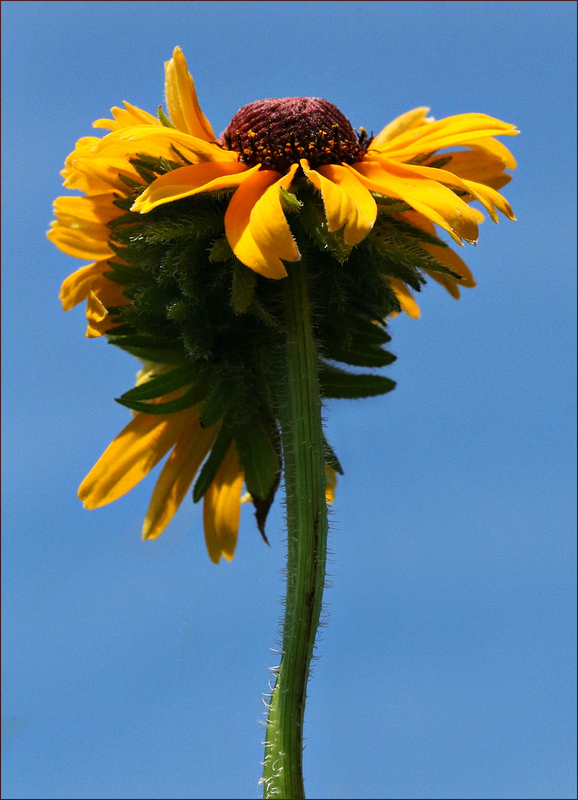 The last photo of the black-eyed Susan was the hardest, simply because it wasn’t much more than a foot tall, so getting it framed against the sky required some hunkering down on the ground — and holding the camera steady. Then, of course, there was getting back up. Sometimes I ponder the similarities between me and some of my “crafty” friends. Instead of baskets and bins of ribbon, sequins, paint brushes, and so on, I have files full of snippets of interesting this-and-that. Now and then, I suddenly see the relationships among some of them, and have the fun of putting them together in interesting ways. I learned several new words today – fasciation and sagacity. Sagacity makes life so much more enjoyable. I love letting my mind wonder from one topic to another barely linked topic. Following those connections is great fun, isn’t it? I suspect you experienced the same thing I did — in school, they called our mind-wandering daydreaming, and didn’t seem to be in favor of it. But letting our minds wander is so important to creativity — at least, I think it is. Finding new words is great, too. I’ve been finding some new ones recently. The trick is finding good ways to use them, so they’re not forgotten. It’s only been in the last few years that I have even encountered milkweed and known what it was. Last spring I planted the two local varieties in my yard and they never even budded! A couple of weeks ago I discovered a Wisconsin variety. I am captivated by them now and so happy to meet another variety here!! One thing that I’ve heard time and again is how difficult it can be to propagate milkweed: even the varieties native to an area. The advice offered by the milkweed experts at our local native plant society is to always begin with plants, not seeds. Beyond that? I think luck plays a role. It amuses me that milkweed can spread through vacant lots and fields without one bit of trouble — just those little seeds blown hither and yon — but when we try to encourage it to grow where we prefer, it grows sullen. Did you happen to see the milkweed post from a few weeks ago on my other blog? I suspect not, given your travel and other activities. I think this is one of the most beautiful I’ve seen. Thank you, Linda! You are right, I didn’t see this, but it is indeed beautiful. I bought my four plants, two local species, from a native plant nursery. I should ask them if they have any ideas why they didn’t form flowers. I just learned something about A. perennis at our native plant society meeting on last Monday. It doesn’t utilize the fluff attached to most milkweed seeds. Rather than being distributed through the air, the seeds simply drop to the ground, or into whatever water is around. Amazing, really. I read this eons ago — I can’t believe I didn’t comment. Maybe I started and walked away. Who knows. Love the photos — that milkweed and the (was it) sunflower (?) that was fused together like a Siamese Twin. (Is that even politically correct anymore?). The word serendipity is one of my favorites. I believe in its concept and it just falls trippingly off the tongue! It’s a black-eyed Susan — a Rudbeckia. I do have trouble distinguishing all the yellow flowers that pop up in summer and fall, but the “eye” of this one helps to identify it. As for the phrase “Siamese twin,” I don’t have any problem with it. When it comes to favorite words, serendipity is a good one — as is the experience. The truth is, we never know when something utterly unexpected and delightful is going to show up — and thank goodness for that.